Champion R15 compressor pumping slowly? You are here: Home / Champion R15 compressor pumping slowly? How come my Champion R15B compressor is pumping air slower than its rated capacity? I have recently mounted a used Champion R15B compressor to an 80 gallon tank. It has a 16.5 inch flywheel and is attached to a 5 HP 220 Volt motor spinning at 3450 RPM. The electric motor has a 3.5 inch pulley. According to my calculations, this is spinning the compressor pump at approximately 730 RPM. The pump is listed at 710 RPM max, so not sure if this small percentage of increase has anything to do with it, but the compressor pump seems to be only delivering about half of rated capacity, or less. From zero to shut off at 125 psi, it takes 14 minutes to fill. At lower pressures, say up to 50 psi, it appears to be pumping at about 8 to 9 CFM, but after that it drops off, and the best I can tell by the time it gets between 100 and 125 psi, its probably only pumping about 6 CFM or less. This pump is rated at 16.5 CFM at 175 psi. I can find no visible or audible air leaks. I removed all four valves, and cleaned and inspected those. Unfortunately they were not gunked up, and appeared to be in good condition, with no carbon deposits, just some sticky oil residue, which I cleaned off with gasoline, and reassembled. This did not help, really. 3. Ran compressor without intercooler tube attached to check each piston. Both were functioning independent of the other. housing, as expected. But, air flow seemed minimal from governor housing back to intake manifold. So unless air is dumping back into the crankcase, I believe the unloader valve is functioning as designed. 6. It has an oil monitoring device on it. I disconnected the tube from governor housing and plugged it in case that was a source of escaping air. No change. 7. Removed the valves again, and put a couple of tablespoons of Marvel Mystery Oil on top of each piston and allowed to soak for 30 minutes or so, then soaked out with a paper shop towel. After reassembly, no noticeable change. The best I could tell, the pistons and cylinder walls looked really clean and shiny. 8. Checked for excessive blow by in crankcase. The best I can tell, its minimal. So, I am at my wits end and exhausted my knowledge as to why this compressor is not pumping much air. 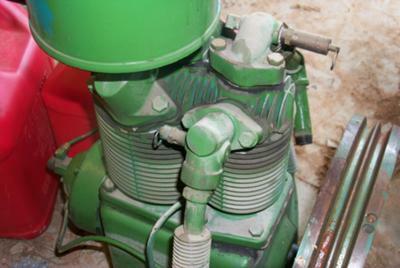 I had a B5900 pump mounted on it previously, that could fill the tank from zero pressure in about 8 or 9 minutes all the way up to 175 psi Same electric motor, just different pulley. The B5900 pump developed a reed valve problem or head gasket problem was why I changed out to begin with. I may have to fix it if I can’t get this Champion to pump much better. Any ideas what may be wrong with the Champion R15B ?? Terry, I am in awe of your expertise with compressors. You should be writing this column, not me! If the compressor rings are good, and air is being compressed, all I can think of that you haven’t already examined is an internal gasket leak. Good luck, and thank you for the detail. If there are compressor mechanics out there that have a comment on Terry’s work, please post. Thanks, Bill, for your kind comment. I’m not a professional compressor mechanic, but in general I consider myself to be good at repairing things. Just a follow up report. I decided to remove the High pressure port tube to the governor housing all together, because my existing pressure control valve had a built in unloader valve and drained off pressure when electric motor shut down. I can see no real need to have two sources to unload pressure on the piston. I plugged the port at the HP piston exhaust and at the governor housing. I left the tube connected running from the governor housing to the Low Pressure piston intake manifold, because that appears to be the only source of outlet for any crankcase blow by pressures, which as you know, could blow out my crank shaft end seal. Pumping capacity by removing the HP port tube increased dramatically, but still not what it ought to be. I got out the calculator and from bore and stroke and pump RPM, this compressor on the big low pressure piston has a 21 cfm displacement capacity at zero pressure free air flow. Of course that would start dropping immediately with pressure build. It now is pumping about 9 cfm between the 95 psi cut in pressure I have set up and the 125 psi cut out pressure. Time from cut in to cut out is 2 min 27 sec. It was original taking 4 min 10 sec to pump same colume and pressure. I still believe this particular compressor is capable of pumping around 16 to 18 cfm at these pressures, so I am still thinking a strategy. My thoughts right now are that the piston rings are stuck or damaged. And possibly the valves are not as good as they could be. So, when I can do without this compressor during break down / repair period, I will remove the cylinder and pistons and examine closely. I have a little 20 gallon Sears compressor that can fill in for awhile. I’ll keep you posted and possibly send some disassembly pics when I do. Follow up – Found it! Well, Duh, I found the problem. I was told it was a Champion R15b pump, and there is no markings or name plates on the compressor pump to label it. So I decided to check the stroke, and I removed the intake manifold and intake valve on the LP piston. And after carefully measuring stroke while rolling it over by hand, I discovered a revelation. It has a 2 inch stroke, which makes it a Champion R10D pump. The R15B pump has a 3 inch stroke. Cylinder bores are the same on each, and they look identical on the outside. Bottom line, the R10D pump I have is probably pumping close to its normal capacity, according to some Champion pump data I have found. Probably a little too late to take it back to the fellow who sold it to me, and let him know its not what he said. In reality, he may not have known himself. Sorry if I led anyone down a wrong path.